Increased alertness: contains caffeine* which helps improve alertness and concentration. Helps you feel energised: the vitamin B1 and B2 in Berocca work with your body to naturally release energy from your food. Reduces tiredness and fatigue: the vitamin B3, B6 and magnesium in Berocca help reduce your tiredness and fatigue. *It is recommended not to exceed a daily intake of 400mg caffeine from all sources. Berocca is not recommended during pregnancy. Suitable for: vegetarians and vegans.Berocca Boost Effervescent Tablets contain caffeine, designed to give you a little kick exactly when you need it. 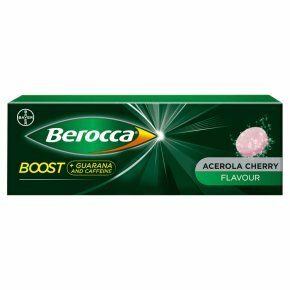 As with every Berocca product, Berocca Boost contains all eight B vitamins along with magnesium, zinc and vitamin C. However, Boost also contains the natural herb guarana and, thanks to the caffeine in each effervescent tablet, Berocca Boost is great for helping to improve your alertness and concentration when you need it most.